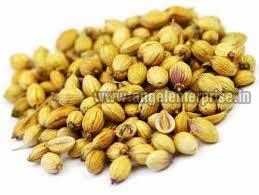 We are offering Coriander seeds. Angel Enterprise is an eminent Exporter and Supplier of wide assortment of products that includes yellow maize, yellow millet seeds, black eyed beans, Bengal gram and green gram. The offered range of products is sourced from reputed vendors who use advanced agricultural practices ensuring the best quality and high nutritional value. They are processed under hygienic conditions that assures high degree of purity. Our products are widely used to prepare flour and recipes as well. We can make available edible products in small as well as bulk quantities for meeting the diverse requirements of buyers.